In the section on Birth myths of the nations of Britain we discussed the traditional perspective which held that the Britons were substantially wiped out in the East of the country by the Anglo-Saxons. This view owes much to the writings of the British monk Gildas. Gildas' De Excidio et Conquestu Britanniae was written around 540 AD with the intention of showing that his people, the Britons, had been justly punished by God for treachery, religious backsliding and internal squabbling by the adventus Saxonum - the coming of the Saxons. 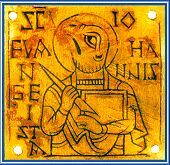 Nicholas Howe (Migration and Mythmaking in Anglo-Saxon England, 2000) argues that later 'Anglo-Saxon' writers reformulated Gildas's writings so that instead of being 'the end of British history' the adventus Saxonum became a migration myth which formed the beginning of English history. In a variety of texts, ranging from Bede's Ecclesiastical History to the Old English verse Exodus, the Anglo-Saxons were presented as a chosen people (like the Israelites) who had left pagan Germany for the the Promised Land of Christian Britain. These new-comers were from the three most formidable races of Germany, the Saxons, Angles, and Jutes. From the Jutes are descended the people of Kent and the Isle of Wight and those in the province of the West Saxons opposite the Isle of Wight who are called Jutes to this day. From the Saxons - that is, the country now known as the land of the Old Saxons - came the East, South and west Saxons. And from the Angles - that is, the country known as Angulus, which lies between the provinces of the Jutes and Saxons and is said to remain unpopulated to this day - are descended the East and Middle Angles, the Mercians, all the Northumbrian stock (that is, those people living north of the river Humber), and the other English peoples. "The key to understanding the passage on Angles, Saxons and Jutes is that it attempts to explain the political realities of 731. Archaeologists have discovered overwhelming evidence from cremation urns and their patterns that in many parts of England, Angles and Saxons settled side by side rather than in different parts of the country. The Jutes have been much disputed, but they had admitted archaeological links with Kent. The area of Angulus was indeed deserted as Bede says; a rise in water-level could well have contributed to the departure of its people. Angles and Saxons formed the bulk of the settlers, but Frisians and Franks from the Ruhr such as Boructuari and Rugini were also among them (V.9)"
St. Germanus visited Britain for the second time in 447, a year prior to his death in Ravenna. On this occasion, he was accompanied by Severus, Bishop of Trier. Around this time, the Britons "inflicted a massacre" on the Picts and Irish which led to a brief period of peace. However, this was soon followed by further civil war and plague. According to the much later Anglo-Saxon chronicles, c.450 (the first year of Marcian and Valentinian), Hengest arrived on the shores of Britain with "3 keels" of warriors, and was welcomed by Vortigern. In Latin this was termed the "adventus Saxonum" or the coming of the Saxons. Two years later, Hengest invited his son Octha from Germany with "16 keels" of warriors, to occupy northern coastal areas and provide a defence against the Picts. Thereafter, the Picts never troubled the country again. 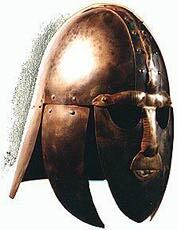 By 453 the Saxons became more restless with frequent raids on British towns and cities.